Safely and easily disconnect and reconnect customer electrical service by bypassing meter sockets under load. 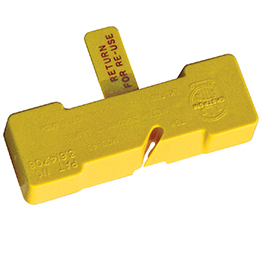 Load-side indicators warn of unwanted potential, eliminating the risk of possible faults during reconnect. Patented ejector handle and high-fault- interrupt circuit breaker ensure safe, quick and proper removal. Available as a complete kit including EK Disconnect device, LP Series adapters, sealing rings, bladed covers and convenient equipment bag. Low profile adapter contains only line-side connections in order to provide potential to metering electronics AMI, TOU, IDR on a disconnected meter stored in the meter socket. 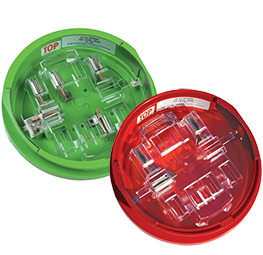 Can be molded of red or green polycarbonate for high visibility of disconnected meter. 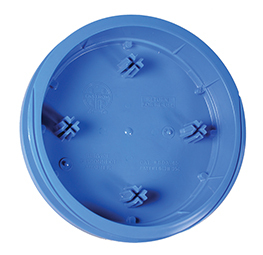 Meter Device Disconnect Sleeves "The Blue Boot"
Brooks MDDS product offers an improved design over the previously offered MD-5 class of disconnect sleeves. 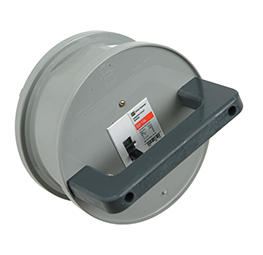 Disconnect sleeves, commonly referred to as meter boots, are used by electric utilities to safely isolate a meter temporarily from the electrical service while keeping the meter in place. 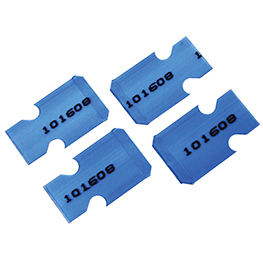 The Blue Boot, stamped from Kodar® PETG Plastic, offers a distinctive shape to prevent premature tearing of the sleeve along common stress points. Due to the material and the unique shape of the sleeve the strength of the product is substantially improved. Try the Blue Boot today and take advantage of a more durable sleeve. Made of high-impact nylon, MDD 45 can be reused many times. Reduces disconnect costs to pennies per meter. Excellent dielectric strength of 8 KV. Can be used as line insulator when socket is being serviced. When used for meter disconnect, meter is rotated 45°. Rotation positively disconnects meter, with no possibility of current leakage. Safely checks single-phase sockets for faults and backfeed conditions prior to reconnecting kWh meters. Its rugged and durable design also allows safe disconnects on single phase lever bypass or horn bypass sockets through its built-in 50 amp circuit breaker. 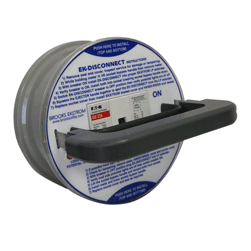 Brooks patented, reusable service disconnect adapter provides a safe and economical means of disconnecting service on installations where it is not desirable to return meters to the shop. Meter readers will quickly spot this disconnect, because the meter is at a 45° angle.